HydroFLASH is a Flexible Lighting and Sprinkler Home controller. 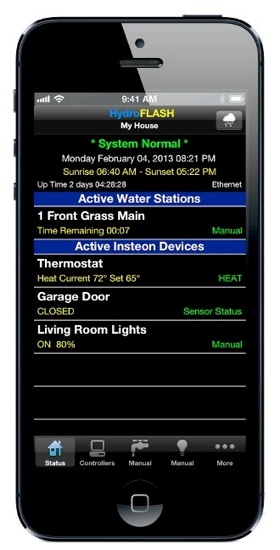 It connects to your wireless network allowing you to control your sprinklers, lights, garage doors, and thermostats using your smartphone or computer. HydroFLASH replaces your current sprinkler controller and provides expanded capabilities that could save you a lot of money on your utility bills. It uses local weather data from your internet connection to automatically place your sprinklers on rain delay. It also tracks sunrise and sunset through out the year enabling lighting programs to use less energy during the summer months.